Kahu Silva had the pleasure of performing a unique Hawaiian blessing of the members of the Teen Advisory Council Summit gathered at the Hina Mauka care office in Kāne`ohe. The 22 high school students were chosen from all socio-economic levels from every major island, to experience an intense but fun 4-day training session to learn the dangers of meth, leadership and media skills and event planning. 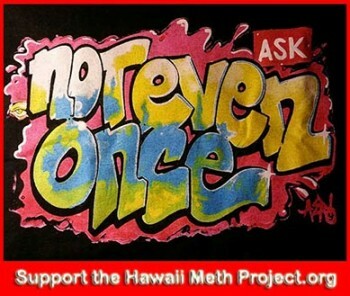 The council will be inducted at the state capitol as the Teen Advisory Council Summit commences with the members committing to serve a one-year term as ambassadors to spread the important Hawaii Meth Project message, “Not Even Once” to their peers. In addition to the Hawaiian blessing, Kahu Silva also taught the council members the hā (breath of life) breathing and meditation techniques to help empower them with positive energy, inner peace and harmony, and the ability to maintain pono (good) attitude, their focus and perseverance in their journey toward their goal. He shared the deeper cultural meaning and hidden spiritual significance of 22 traditional Hawaiian values that each participant personally selected. They were all amazed to realize how meaningful each value including `ohana (family), kuleana (responsibility), lōkahi (unity), laulima (working together) and aloha (love) had in their lives and how each value will serve as an inspirational guide in their efforts to educate and help their fellow students and others in their communities to make it their kuleana to make the right choice. The important lesson is that aloha and all that it means is always a better way to conquer life’s greatest challenges and the reward is the real blessing.